[color-box]The story below concerning the arrests of innocent Christians in Indonesia for “evangelism” is the main reason I personally don’t buy clothing from nations where Christians are brutalized and persecuted by Muslims. I check the labels in every shirt and on any package of socks or underwear because I don’t want to finance the persecution of Christians. Many good, cheap garments are made in free nations such as Columbia and other Central and South American nations. India is a democracy and although Christians have problems there, the nation is not in the major business of persecuting them as is true in Bangladesh, Pakistan and Indonesia. Muslim Bangladesh is probably the worst of the offenders in persecuting not only Christians, but Buddhists and Hindus as well. Pakistan is nearly as bad, and Indonesia is no better than Pakistan. JAKARTA, INDONESIA (BosNewsLife)– The United States was under pressure Friday, October 4, to condemn “grave violations” of religious freedom in Indonesia amid reports that two Indonesian Christians were sentenced to three years imprisonment for evangelism. 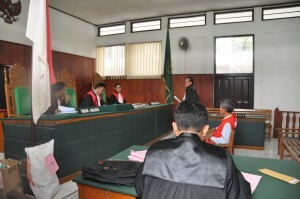 Photo of the August 2nd court proceedings against Kashfi Rosyid and Jalaudin where they were sentenced to three years imprisonment. Obama was canceling his trip to Asia to stay in Washington and push for an elusive funding bill to end the nation’s government shutdown, but the White House said Secretary of State John Kerry would fly to Bali, Indonesia, on Friday, October 4, to head the U.S. delegation to the October 5-7 summit. It was not immediately clear whether Kerry was aware of the detention of Christians Kashfi Rosyid and Jalaudin, who were reportedly detained by police on March 20 in the city of Sukabumi in West Java province after an angry mob of some 200 Muslims reportedly attacked their home. The International Christian Concern (ICC) group, which assists the two brothers with advocacy, told BosNewsLife that Rosyid, 58, and Jalaudin, 65, have both been beaten at least once by fellow inmates since their imprisonment. They were sentenced after the two men had helped to convert more than 100 Muslims to Christianity in the area around their home, Christians said. The attorney representing the two Christians has given up on appealing their three- year prison sentence after facing “significant pressure” from local authorities in what is the world’s largest Muslim nation, ICC said. Additionally Rosyid’s family has been “chased out of their village” with their current whereabouts unknown, while Jalaudin’s family was forced to resettle in an undisclosed location in West Java, Christians said. The families reportedly received some support from outside organizations, but are still struggling to cope with the imprisonment of Rosyid and Jalaudin, according to ICC investigators. It comes amid a wider crackdown with on devoted Christians, church groups say. In 2012, at least 50 Christian churches were forcibly shut down by local governments across Indonesia under pressure from radicalized political groups, such as the Islamic Defenders Front, according to ICC estimates. Rights activists have expressed concerns that President Obama, who spent part of his childhood in the country, lauded Indonesia as a model of religious tolerance. In May of this year, Indonesian President Susilo Bambang Yudhoyono accepted a “highly disputed award” from the New York-based Appeal of Conscience Foundation for his promotion of religious tolerance, ICC recalled. The award was accepted despite protests by religious minorities, who claim to have seen incidents of violence and discrimination rise rapidly over the last several years. It also expressed concerns about religious intolerance in Burma, also known as Myanmar, after the outbreak of anti-Muslim violence in the country over the past year and ongoing attacks against the predominantly Christian Kachin community.